You have to love Shahira Hammad for envisioning a train station where your principal concern wouldn't be getting there on time, but whether you could find your way out at all. 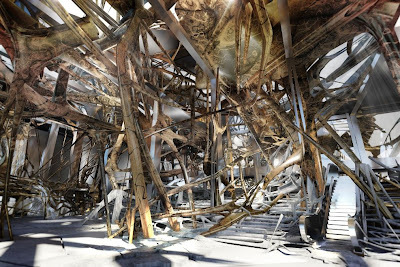 Hammad's proposal to revamp Vienna's staid Westbahnhof station draws heavily from natural processes like growth and entanglement: It looks like an immense rootball sprouted dozens of legs and started mating with a building. The structure is supported by thick, brown tendrils akin to mature poison-ivy vines. Peeking through these is an internal system of webs and membranes that appear to have been inspired by the thatched roofs of a shantytown, dimpled pig tripe and spindly rib cages. One of the driving forces of the universe in the foreseeable future is entropy, often described in layman's terms as the tendency of things in the universe to go from a state of order to a state of disorder. This design certainly has gone to disorder. One of the principles of architecture is that function is greater than or equal to form. This design looks nearly functionless, and the form is not pleasing at all. As such, one can only imagine that the artist/architect is an anarchist. Maybe anarchist is what Shahira thought an artist/architect was. On the other hand, some of Gehry's buildings are very nearly anti-buildings, and he's considered a superstar or thereabouts...so where do you draw the line? Gehry's designs are always intended to be built, I think. My perception is that given Gehry's reputation, his clients expect a very high wow/bizarre/thud-as-jaw-hits-floor factor, and quite often are sufficiently mesmerized by Gehryism to just get out their checkbook. So while his designs often are anti-buildings, they're *practical* anti-buildings. You can live and work in them quite effectively, if you're already crazy. 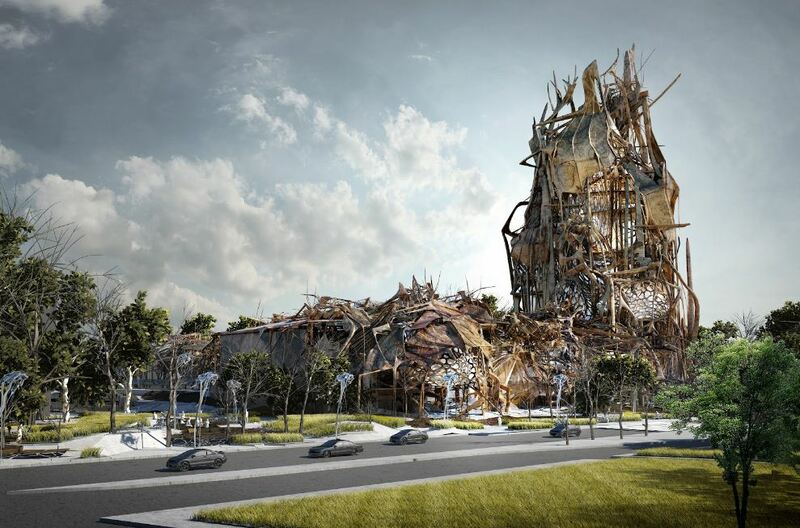 But it's always been the norm for young architectural tigers, having broken through to be invited to submit to a competition, to prepare something that they know won't be chosen--i.e. an *impractical* anti-building--but that will get them talked about and remembered... not so much for the particulars of their design but for the arguably-tired-arguably-useful concepts and boundaries that they made the architectural world think about, at least briefly. Think what? About Frank Lloyd Wright's buildings that are still standing today. Briefly. Today, 8/26/12, AOL has a picture of one of Wright's beauties scheduled for demolition in Arizona. Built for his son in the fifties and looking fabulous today, is making way for a couple of mc'mansions. The Guggenheim Museum in NYC was built in the same timeframe.